Based on God’s word in the Bible, the author shares knowledge and insight on what foods should people eat and what should be avoided in “Sanctuary Recipe Cook Book”. Through this book, the author wonderfully lays down everything she knows about proper nutrition as it is told through God’s word. Francesca Ify Iwunze believes in the power of proper nutrition based on God’s word. Through his teachings in the Bible, people receive spiritual sustenance but it goes beyond just that. In her unique cookbook, she shows readers how spiritual and physical nutrition should work hand in hand. She says that her book is “…about the God we serve in his sanctuary and how his word can serve as either spiritual foods or physical foods. We would be satisfied in Christ Jesus when we eat any of his foods, and these foods are not meant to be sick and gluttonous in nature"
With that in mind, she wonderfully lays down everything she knows about proper nutrition as it is told through God’s word. 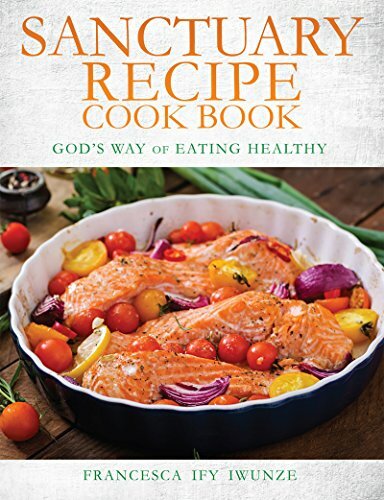 In “Sanctuary Recipe Cook Book,” readers will find what foods should be bought and cooked as recommended by God and which ones can lead to serious diseases such as diabetes, being overweight, high blood pressure, and even cancer. Not only that, she provides insights on the obstacles that many Christian faces and hinder them to do better in life—from their lack of faith, low self-esteem, procrastination, to laziness, and fear of failure. Most of all, she evangelizes the choices that people make when it comes to food and how it can make room for a true and wonderful transformation in life. Because of her valuable knowledge, Iwunze’s “Sanctuary Recipe Cook Book” has wonderfully touched the hearts of many as it successfully took part in the festivities during the 2018 Miami Book Fair International. Interested readers may purchase a copy for them to keep through Amazon: https://www.amazon.com/Sanctuary-Recipe-Cook-Francesca-Iwunze/dp/1498489680/. “One thing have I desired of the Lord, that will I seek after; that I may dwell in the presence of the Lord all the days of my life, to behold the beauty of the Lord, and to enquire in his temple” (Psalm 27: 4 KJV). This verse captures the fervent heart of Francesca for God. Studied food and nutrition, B.Sc., and RN /BSN in Nursing, Francesca loves the LORD passionately and loves to work for him. She attended MFM School of prayers. She currently serves as one of the servants’ women leaders of Citadel of Solutions and Deliverance, USA region 7 headquarters in Saint Paul, Minnesota. She also works as a Nurse Supervisor and as a Public Health Nurse Mentor nursing student from Globe University in transition at Crown Medical Center Minneapolis. She is the owner of Higher Ground Boutique in Minnesota. She is also the author of “God’s Secret ways of losing weight: My Body, God’s Temple” and a founder of Sanctuary Recipes diet. Francesca believes that the obstacles that always fight Christians’ desire to do better in life are the lack of faith, laziness, lack of knowledge, lack of vision, low self-esteem, intimidation, procrastination, fear of failure and the unknown, bad friends and cliques in the church of God. She says that one should always decree a thing in Jesus Christ and then it will be established. She evangelizes about the choices of food we should buy, cook and eat every day in our lives. She describes how we should use herbs and spices as the alternates to the sugary and salty intakes for our long-life transformation. Our relationship with our God gives us the upper hand to excel in knowledge, wisdom, and our God-defined destiny.